The new Black Iron Trainer is a lighter version of the heavyduty, high-performance Black Iron Master. While the Black Iron Trainer is smaller and lighter in weight, it is capable of handling the wide range of handle diameters that are encountered in modern fitness and exercise facilities. The completely manual operation and positive locking and unlocking design provides uncompromising security and stability for bench pressing, dumbbell flys, dead lifts, pull-downs, and more. The Black Iron Trainer , with a load-rating of 440 lb., also carries a smaller price tag than its larger cousin. Provel offers cost-effective, fast, easy-to-use, and reliable O&P automation . The D2 digitizer, C5 carver, and T6 thermoformer are appropriate for small clinics as well as large central fabs. All are AOPfile compatible and backed by a two-year warranty. The D2 digitizer allows automated shape capture of prosthetic casts with unmatched accuracy. The C5 carver is not only fast and precise, its self-contained dust-collection system is extremely quiet. The T6 thermoformer consistently produces high-quality thermoplastic sockets from industry-standard preforms. 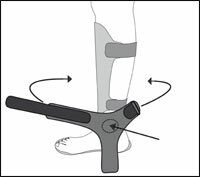 Matthew Dobbs, MD, designed this new dynamic clubfoot bar to allow active movement, preserve muscle strength in the foot and ankle, and be less restrictive to the child than traditional fixed bars. Children using the Dobbs Bar can crawl and kick their legs independently. Children will sleep better because they can get comfortable in the Dobbs Bar , and heel blisters commonly associated with fixed bars are no longer a problem. The Dobbs Bar is available in two sizes, small (6 to 9 in.) and regular (8 to 14 in.). The bar is adjustable through each size range to accomodate growth. The foot plates are universal and can be attached to shoes and AFOs. The results are better compliance, a more active child, and happier parents. Now through March 31, 2009, the new EZ Flex Liner from ALPS is available to SPS customers at a low introductory price! This liner was developed to provide greater elasticity over the patella while limiting posterior vertical stretch, eliminating pistoning. The EZ Flex Liner combines an unlimited- stretch anterior fabric (for reducing pressure on the knee) with a posterior fabric that has 80 percent less vertical stretch than other ALPS gel liners. This pairing reduces energy required to flex the knee and minimizes fabric bunching behind the knee, significantly increasing comfort. When an insole just isn't enough, the ToeOFF® T-Strap pulls the talocrual and subtalar joints laterally to reposition them under the tibia. Quick, easy application. Distal end attaches to the ToeOFF footplate, and the proximal "T" wraps around the ankle and attaches to a lateral strut. Easily customizes to patient's medial malleolus height. Easy to position over the malleolus. Plastazote® core can be heated to improve shape and fit. Durable, breathable outer. Polyester padding comforts the skin. Otto Bock's Helix 3D 7E10 is the first hip joint with hydraulic stance- and swing-phase control. The Helix 3D provides pelvic rotation and a greater flexion angle, giving users more natural gait patterns and increased freedom of movement. The Helix's three-dimensional movement mimics the human hip joint's natural and symmetrical gait pattern. Its polycentric design allows for leg length reduction during swing phase, which reduces the risk of falling and increases function. 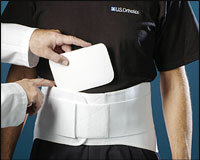 The new Orthomerica® ECO™ (Extension Compression Orthosis) stabilizes the pelvis and lumbar spine to ease pain. It's as simple to apply as a backpack or jacket, with easy-to-reach, selfadjusting, padded shoulder straps. The metal spine frame can be easily contoured to the patient's thoracic and lumbar spine. Patented abdominal component made of breathable mesh provides cinching mechanical advantage. 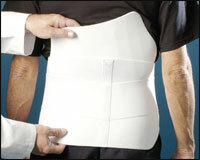 Detachable abdominal component can be used independently to provide a functional lumbar spinal orthosis. 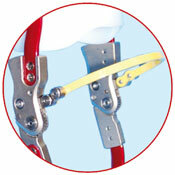 Durable, patient-adjustable, one-pull compound closure. Patient-controlled shoulder extension improves compliance and tolerance. Requires no tools for fitting. Friddle's Orthopedic is proud to now offer the Royal Flush line of socks from Royal Knit. These wonderful socks stretch in both length and width, are form fitting, and-the best part-are simply wash and wear. The Royal Flush socks are latex free, resist shrinking, and are odor and mildew resistant. They are offered with and without a distal rubberized reinforced opening. Visit us online for pricing. Committed to providing you with new options and economical alternatives, SPS announces a new Saturday Shipping Service . You may now place an order on Saturday for Monday delivery via UPS Air for only $12.50 per box above normal next-day air charges. This new service applies to all next-day air orders received on Saturday by 2 p.m. EST. The Saturday Service program commenced February 1, 2009. The next level in comfort, the Echelon foot is designed for the low- to high-impact K3 amputee who may enjoy occasional recreational sports. Lightweight and dynamic, the Echelon utilizes hydraulics to control plantar- and dorsiflexion. Independent hydraulic-controlled plantar- and dorsiflexion. Self-aligning feature provides comfort while traversing varied terrain or standing. Biomimetic design simulates more natural ankle motion. Hydraulic ankle dorsiflexes, which allows for greater toe clearance during swing phase. Compact design allows for cosmetic finish. Foot shell and glide sock included. SPS announces the immediate availability of the new Boston LS from Boston Brace. This off-the-shelf LSO has removable anterior and posterior rigid panels that restrict motion, while its crest rolls prevent migration. The Boston LS has a double elastic overlap, making it simple to don and adjust. Becker now offers the Shoulder Abduction Rotation Orthosis ( SARO ) in additional sizes and increased adjustability to enhance its clinical application. Since 2002, the SARO has gained wide acceptance in the O&P community and has been used successfully for pre- and post-operative management of the pediatric shoulder joint. Increased adjustability at the shoulder and elbow joints. Available in large and extra large sizes. Humeral cuff with raised posterior wall for additional control. Lightweight, universal design can be used for the left or right shoulder. For amputees requiring low-activity feet, Ohio Willow Wood offers its SACH and Single Axis feet . Both are of lightweight construction with attractive, lifelike, unisex cosmeses. The SACH foot , available with a titanium pyramid, offers flexible toe belting with three toe resistances, two heel heights, and interchangeable heel inserts. The foot cosmesis is waterresistant. Ohio Willow Wood's Single Axis foot is 10-20 percent lighter than conventional single-axis feet. The foot may be customized using six deflection bumpers, three toe resistances, three heel densities, and two heel-height options. OTS Corporation has redesigned the StepLock handle to allow the use of a special bail kit. In the past, a stiff connection between the two joints risked one side locking while the other was not completely locked, causing the last ratchet tooth to be worn away. The new bail kit has rubber grommets inside the connection, allowing some play between the two sides. The kit attaches through two spaces in the redesigned handle, which allows for a better lever release kit connection. The new handle is less obtrusive and less likely to catch on clothing. It is now standard on all StepLocks ordered. The new 650 APU®/PS/B from Anatomical Concepts is available for immediate shipment from PEL Supply. Used with the APU (Adjustable Posterior Upright) orthosis, this new full-foot moldable insert is available with a variety of liners. ¼-in. 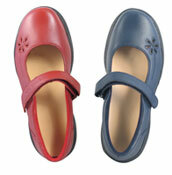 full-foot moldable insert fits adult sizes 8-12. 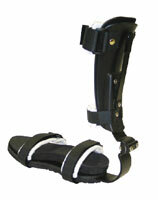 Foot orthosis used for treating plantar surface problems or enhancing control of foot/ankle complex. Distal toe extension can be trimmed/modified for a more customized look. APU joint adjusts in sagittal plane for plantarflexion/dorsiflexion. Various lining systems are available by request. Touch Bionics' new, vastly improved i-LIMB™ Skin is now available in both clear and black at SPS. 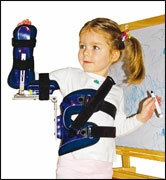 The i-LIMB hand's range of motion is improved by the new i-LIMB Skin . With its increased durability, the new skin will last approximately two to three months, depending upon use, versus one to two months for the previous design. A new, interior slip coating makes the new skin easier to don and doff. All SPS customers who have previously purchased an i-LIMB hand and skin will be shipped one new i-LIMB Skin . Order a Fusion or Duralite Foot and Receive a Free Ping Golf Shirt! Duralite : Only 356g, the Duralite is lightweight without compromising energy return. Its unique composites increase deflection and energy, and the included reinforced sole makes it more durable and longer lasting. Sixty-day trial period. Fusion : The Fusion Foot rides on snubbers that provide smooth heel-to-toe motion with little effort. The gap between the plates deflects at an angle to the foot plate, creating vertical shock compression. Adjustable snubbers allow the plates to flex, bend, and touch, providing medial/lateral stability on uneven terrain. Sixty-day trial period. T-shirt promotion good through March 2009. Can you imagine fighting in a war without a rifle? Can you imagine practicing P&O in the 21st century without an outcome measurement tool? Enter the Kinematic Arts VFX Timing System . The VFX is capable of recording patient walking times at the flip of a switch and is accurate to a thousandth of a second. Its cordless and clutter-free design allows for seamless integration into any clinical environment. 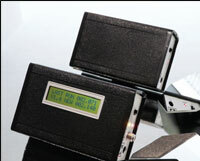 The VFX System includes a transmitter, receiver, charging units, mounting brackets, and military-grade bounce mirrors. Designed and manufactured exclusively by U.S. Orthotics, the FULLBACK™ XPA lumbosacral support offers a variety of features tailored to your patients' needs. Our FULLBACK XPA is an effective elastic back support with anterior and posterior pockets that accommodate thermoformable Kydex inserts, all in a single-piece design. A top tension strap can also adjust for proper pressure and comfort. Two pre-molded inserts are included. The FULLBACK XPA can be ordered in black or white. 8-in., 10-in., or 12-in. back heights. SADMERC Verified L-0627. The Sure-Lok ™ is the world's first infinitely adjustable cable lock and retainer system for body-powered prostheses. This revolutionary technology mounts on the patient's voluntary opening (VO) or voluntary closing (VC) prosthesis. VO users can lock the cable to avoid damaging objects, and VC users no longer have to maintain cable tension to retain their grasp. With the Sure-Lok engaged, it's possible for your patient to obtain greater pinch forces than with VO setups, even while relaxed. The Sure-Lok disengages easily. Dycor's new K2 (assisted ADL) DR feet (purple) are 30 percent more flexible than the K3 (unassisted ADL) DR (black) version. Titanium pyramids are now standard. Similar to energy returning designs, Dycor's DR feet are lightweight and resilient because they rely on deflection of varying thickness leaf springs embedded in the upper keel member rather than on compression of rubber bumpers. Similar to other DR designs, Dycor's DR feet are ground compliant because they incorporate uni-, bi- or triaxial ankle articulation. 12 oz. (26cm); call for pricing. Available in 15 styles, sizes 5, 5.5-11, widths B/D (M/W), 3E (WW), 5E (XW). EVA outsole for easy modification. 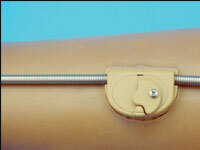 Standard last for easy sizing using Ritzstick® or Brannock® device. The ESP Seal-Pro is the perfect solution for both high-vacuum and standard-suction socket applications! ESP Seal-Pro liners are available uncovered or with cover length customized to your specifications for both transtibial and transfemoral versions. High-vacuum and standardsuction socket applications. Soft and durable pure silicone formula. Orthofeet's new stylish diabetic shoes include unique doublestrap shoes with the slip-on look, and smart Mary Jane shoes with foam-padded straps and lining. Supple leather with non-binding upper design. Soft, seamless, foampadded fabric lining. 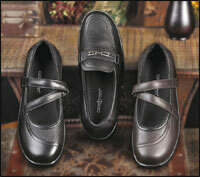 Lightweight sole with a mild rocker design.